Travelers to Germany often feel the need to pay homage to the darkest period in German history. A visit to one of Germany's many memorial sites may be the most important part of any trip to the country. 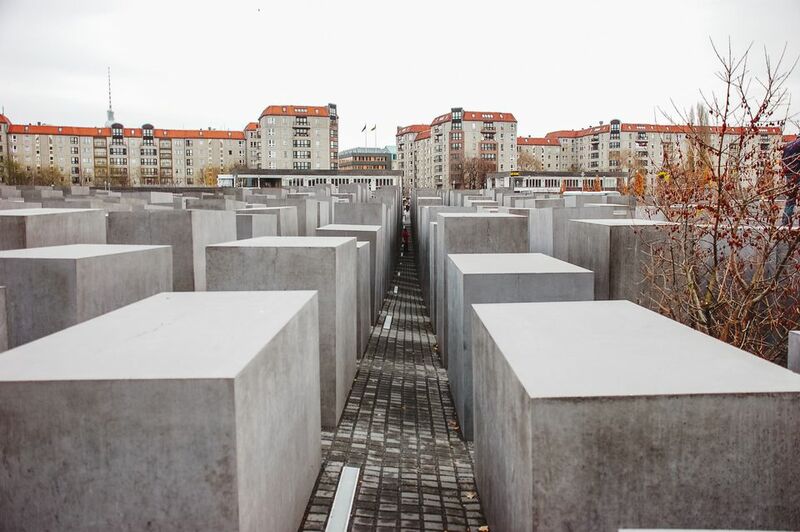 We have detailed some of the most important Holocaust memorials across the country including former concentration camps like Dachau (outside of Munich) and Sachsenhausen (near Berlin). You should visit one of these remembrance sites while on your journey. But you may still be confused about exactly what a visit to one of Germany's Holocaust memorials is like. Remembering the Holocaust in Germany has always been a contentious topic. The largest memorial in Berlin, the Memorial to the Murdered Jews of Europe, took 17 years of planning and two design competitions to decide on its format. And even now it is controversial. How to remember such an enormous, world-changing, and devastating event is no small task. But if you go to a memorial site with the right spirit of solemnity and deference, it is impossible to go wrong. Here are some things you should keep in mind, and activities to avoid. Here is the guide on how to be respectful at Germany's Holocaust Memorials. Most sites welcome photos. Pay attention to signs that note when flash photography is prohibited, or when photos aren't allowed. As a guide, exterior photos are almost always allowed while photos inside the museums generally are not. That said, think about how you compose your shots. Is this the place for peace signs, selfies, and bunny ears? Definitely not. While some people can't resist taking photos of themselves everywhere they go, try to avoid using these sites as a fashion backdrop for a photo shoot of you. It is about the site. So we've established you can photograph it, but can you touch it? It should be clear that the buildings of the former concentration camps are historic buildings, sometimes in a fragile state, and must be preserved. Some visitors like to put tributes on the memorial sites, such as flowers or candles on the train tracks or in the crematorium, but this isn't recommended as it has you walking across these delicate structures. Again, signs usually designate if you aren't allowed to touch but as a rule, you should avoid touching/handling/operating any historic buildings or objects to preserve them for remembrance. This is a little trickier at newer, seemingly unbreakable structures. The Memorial to Murdered Jews of Europe in Berlin has the Field of Stelae which is composed of 2,711 concrete pillars. They are solid and infinitely photogenic. Its location between some of the city's most important sites from Brandenburger Tor to the Tiergarten to Potsdamer Platz begs for people to sit on the lower stones and rest. In fact, the designer Peter Eisenman imagined this as a place for life to happen. He wanted children to run between the pillars and people to touch the stones. His design intends for this to be less a holy place and more of a living monument. But I doubt he could have imagined the phenomenon of Pokemon Go that had figures found at the nearby Memorial to the Sinti and Roma Victims of National Socialism (another mouthful). Perhaps he would be ok with that, too. That said, some people's lack of respect has caused grievances. Visitors leaping between the stones and taking insensitive pictures as if this was a playground inspired an Israeli satirist's art project, Yolocaust. The artist, Shahak Shapira, took tasteless pictures people posted on social media of themselves at Germany's memorials and edited them to include gruesome backgrounds of real-life scenes from the Holocaust. No selfie looks cute with a scene from a death camp. Note that many of these sites are outdoors and weather conditions can change quickly in Germany, so you should be dressed in layers. Whether it be umbrella weather or time for sunscreen (often all in one day), you should come prepared. And just like taking a tasteless picture isn't much appreciated, complaining about the cold as you read about the thousands of prisoners who literally froze to death is a bad idea. At Berlin's Memorial to Murdered Jews, many visitors have recognized the slabs are excellent for sunbathing. Don't end up on Yolocaust by showing up scantily clad to the memorial and sunning yourself. The Tiergarten is literally right next door and offers plenty of vast green expanses where no clothes are required at all. This also may not be the day to wear your hilarious "I'm with stupid" shirt or profanity-strewn hat. There is no need to dress as if you are going to a funeral, but pack in the comedy on the day of your visit and try to pick something respectful. Even we are guilty of this one. We planned a visit to the memorial site at Sachsenhausen, and knowing there wouldn't be many food options, stopped at a deli beforehand and eagerly picked out tasty meats, cheeses, and rolls. After walking around the site for about an hour we dug into our lunch... but the much-anticipated delicacies no longer looked as tasty. Guiltily we nibbled our lunch and hid the remains in our backpack to finish elsewhere. In the years since that visit, the policy has been formalized and you can no longer eat or smoke within the memorial site. Drinking alcohol is also clearly not allowed. This is the case for most Holocaust Memorials in Germany. While anyone should be able to get something out of a visit to Germany's Holocaust memorials, visits might not be suitable for children under 10. This is usually up to the visitors and not regulated by the memorial site, so know your child and use your best judgment. Are there any Memorials in Germany not to Visit? Germany has been careful to avoid making sites significant to the National Socialists (Nazis) pilgrimage points; especially as the recent success of the AFD party exemplifies a surge in far-right politics. It is up to each visitor to decide if they would like to visit. You might be surprised to find that Hitler's Bunker, just steps away from Berlin's Memorial to Murdered Jews, is barely marked with a placard put up in 2006. Hitler's Eagle's Nest is similarly low-key under its German name, Kehlsteinhaus. The Bavarian State took over management of this site in 1960 and made it open to the public with all proceeds donated to charity. Most Holocaust Memorials in Germany offer free entry so that anyone can visit. That said, it costs money to maintain and run these sites. If you visit a site, please donate. There are usually coin collections around the visitor center.